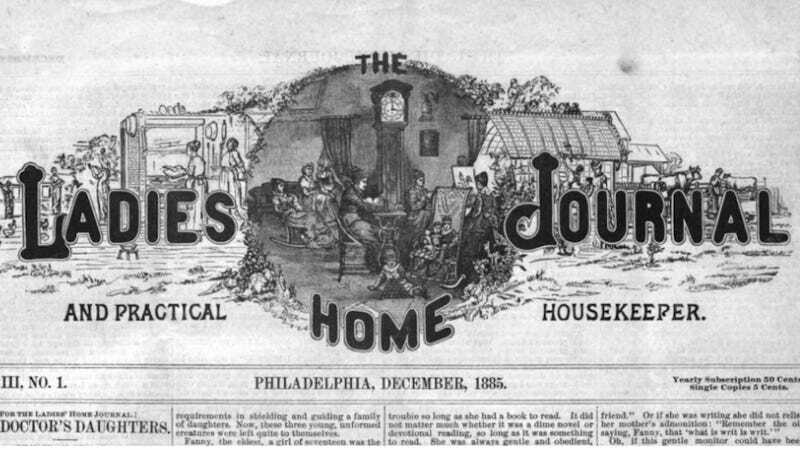 Ladies' Home Journal was launched in 1883 by the Philadelphia-based Curtis Publishing Group; over its lifetime, it straddled three centuries. But it's a monthly publication no more—the staff has been gutted and it'll survive as nothing more than a "special interest publication" sold only on newsstands. I.e., a ghost. Just don't you forget who runs the parlors in this town: "The girl who works sometimes makes one social mistake which is greatly to be regretted. She forgets the value of the woman in society, and caters only to the men. With a party of women she is dull, uninteresting and impatient, but when the men appear she grows bright, witty and attractive. Perhaps she does not stop to think, but she ought to. The girl who tries to please only the men will find, in a short time, that she no longer gets invitations to pleasant houses, where girls less attractive are invited everywhere." Whoever told you otherwise was misinformed. What is even happening with that woman on the bottom right? As it worked out, Jim's final hospital bill was $37.74. He wrote one more $15 check to the grocery store, this one spent entirely on stocking the refrigerator for Lynn's homecoming, and made the fifteenth of the month with $17.28 to spare. Buried among the groceries was one more purchase that had been made directly for Jeff, a 37-cent bottle of corn syrup for a sugar-water supplement to Lynne's nursing. It's like finding the Billfold smack in the middle of Glamour. But what if I was looking forward to that orange? That's not a criticism of the generations of pros who staffed LHJ for decades after the 1910s. It's just an acknowledgement that this magazine was founded as The Ladies Home Journal and Practical Housekeeper, and when you read issues from the first 40 years or so of its history, you understand the subjects this magazine was originally created to tackle. It's amazing they held on as long as they did! Essentially, it was a trade journal for those whose profession was "housewife." And I don't mean bored Betty Drapers. Early issues cover topics like remaking gowns for the new year — because ready-to-wear wasn't a popular option yet — and dealing with ants prior to modern pesticides. (Flood their nest with kerosene oil or boiling water, for the record.) The April 1912 issue contains cross-stitch patterns, advice for the minister's social helper, guides to teaching your children about money, exercise advice for women over 40, rules for picking exterior paint colors, and even a little light palmistry. Plus they threw in an exploration of the state and future of women's colleges. That's not to mention the pages and pages and pages of fiction. Which took a long time to disappear—in the 1950s, for instance, LHJ serialized Edna Ferber's Giant. But it's telling that up until the late 20s, they could slap a dense piece onto the page with a single black-and-white image and that was plenty. Because what the hell else were you gonna do? It's not like they had to compete with the DVR. By the 40s, short stories start with big, colorful spreads the entice the eye. You can tell the magazine is completing with movies, radio and soon enough television, while various labor-saving devices have fundamentally reconfigured the job of running a home. Suddenly you get a lot more emphasis on maintaining your marriage, rather than the physical plant of your house, and "Can This Marriage Be Saved?" pops up. By the 1950s, that's the emotional core of the magazine. And while those topics certainly spoke to generations of American women (circulation didn't peak until the 1960s), they're missing the whiff of elbow grease. I had to stifle a yelp when I saw this appalling advertisement, trumpeting linoleum as the latest, greatest thing. How many lovely 19th century homes were desecrated as the result of this ad? Comparatively, the issues from the 1920s are a disappointment, probably because the target audience for Ladies' Home Journal was busy plowing those stock market gains into nifty new home appliances and linoleum floors, rather than bobbing their hair and sneaking bathtub gin. Basically every woman in America was presumed to have a man on the front, and she's supposed to keep her hands nice — for him! Doing your part to defeat Hitler means keeping your hands kissably soft when you're not attaching rivets to bombers. "The United States is having a boom in babies. The 'first mothers' class' which this timid wife entered the next week has been swamped; That girl with the little veil on her hat, married six years, used to figure the responsibility of a baby would spoil the fun she and her husband had together, and among their friends. Somehow, a few months ago, they woke up to the fact that they wanted a family." You can practically hear the panic about getting women out of all those industrial jobs before the men returned home, wanting a paycheck. How often do you see heels this sensible in a modern-day magazine spread? Whoever convinced American women that heels must be three inches minimum LIED. In case you can't see the text on that L&M ad: "You've bundled them off to school and office. Now you can relax with a second cup of coffee and the full-bodied flavor only one cigarette delivers..." Can I have some quaaludes, instead? Anyway, I get what Jimmy Carter meant about the national malaise, now. Obviously, this is never going to happen. But you know what's amazing and delightful about the pages of Ladies' Home Journal, up until the 1970s? There's barely a mention of Hollywood. The March 1962 cover features a giggling baby, and the big features are about young mothers, talking to teens about "the facts of life," and spending on babies. Not an ingenue in sight. It illustrates how much territory the ladymags have ceded to pointless, boring puff pieces about randos with movies to promote, just so they'll have a famous face for the cover. The stories aren't even juicy! These celebrity dolts are sucking the air out of the room. And they have been, for the last thirty years. I didn't keep a running tally, but starting in the 80s the word "stress" must've appeared as many times as "diet." There were features on his-and-hers stress (part of an ongoing special report on "the stressed-out American family"), how stress is affecting your looks, the women's disease that's NOT stress, even a piece from 1985 on "The Hardest Choice of All: How to cope with the dilemma of doing for yourself versus doing for your family." No wonder we're so stressed. Remember how ten years ago everyone still freaked over marijuana? Good times, good times. If Ladies' Home Journal had managed another decade, might we have seen the perfect pot brownie recipe? Sadly, we'll never know.